Take your playing to the next level with the help of a local or online fiddle teacher. Monthly newsletter includes free lessons, favorite member content, fiddle news and more. Want to hide these Google ads? Join the Players Union! This week's tune is Cotton Bonnet, from the playing of Estill Bingham (14 February 1899 - 18 July 1990) of Bell County, KY. I dedicate this to Mr. Bingham in honor of his birthday, 129 years ago on February 14th. Read the full description by clicking on the YouTube link below. 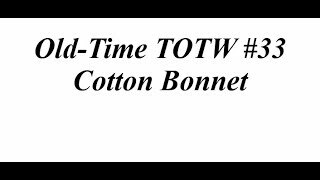 Subscribe to my YouTube channel and Stay Tuned for the next Old-Time TOTW, a different tune airing each Sunday morning. Next week I will feature a fiddler in honor of Black History Month….see you then!